THE STAR arrives on Blu-ray + DVD + Digital today February 20 from Sony Pictures Home Entertainment. 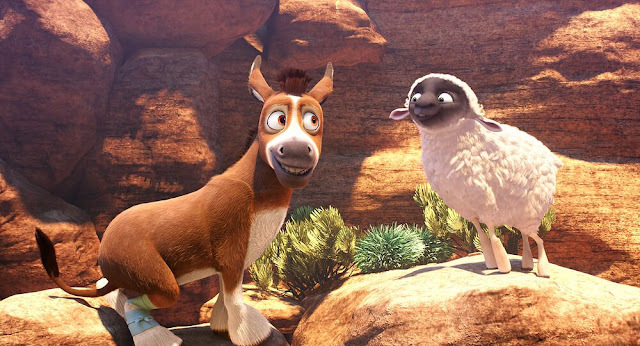 The simple but effective animated comedy tells the story of a donkey named Bo (Steven Yeun, “The Walking Dead”), who sees himself as destined for greater things. The daily grind at the village mill leaves him feeling incomplete and longing. His ill at ease nature eventually pushes to the point where he decides to break free and follow his heart. In the same way Rosencrantz & Guildenstern Are Dead is a retelling of Hamlet through the eyes of ancillary characters, THE STAR is a retelling of the nativity through the eyes of the animals that were there that night. The human characters take a backseat to a donkey and his barnyard buddies. Along his way, Bo teams up with Ruth (Aidy Bryant, “Saturday Night Live”), a sheep who has lost her flock and Dave (Keegan-Michael Key, “Key and Peele”), a dove with lofty aspirations, along with three camels voiced by Tracy Morgan (“30 Rock”), Tyler Perry and Oprah Winfrey. Bo and his new friends follow the star and become accidental heroes in this adaptation of the “greatest story ever told”. THE STAR is a heartfelt retelling of the first Christmas that never takes itself too seriously. As a parent of two boys I tend to rate children’s films on a weighted scale. Their opinions matter far more than mine, the film was after all designed for them. It always makes me laugh when I read a critic who knocks a children’s movie for being “childish”. Yes, THE STAR is a childish film and I mean that as a complement. It’s a silly little movie that occasionally dips its toes in heavier themes but never dwells there. My boys were completely dialed into the humor and didn’t move for the 86 minute runtime. I could easily see THE STAR becoming a must watch every holiday season in our house for the foreseeable future.